Deputy Minister of Finance of Ukraine Artem Shevalyov spoke in an interview with UNIAN about the preparation of a new development strategy for state-owned banks, and the participation of international organizations in the management of state-controlled banks. He also tried to dispel rumors about the non-transparency of the contest for the post of Board Chairman of Ukrgasbank. In late 2014, the post of the chairman of the board for the state-owned Ukrgasbank became vacant. An open competition was held for the first time to find a new head of the financial institution. The process lasted for more than three months. Twenty-one candidates participated, and the nomination committee then chose the winner from among the top five. The winner was the acting head of Ukrgasbank, Kyrilo Shevchenko, who had been seen as the top contender in the banking community. But it remains a mystery who his competitors were. The names of all the participants, as well as of the top five finalists, were never made public. Deputy Minister of Finance Artyom Shevalyov, in an interview with UNIAN, explained this cautiousness as being due to the fear of PR attacks being made on candidates, gave some details of the competition, and spoke of future plans and strategies for the development of state-owned banks. 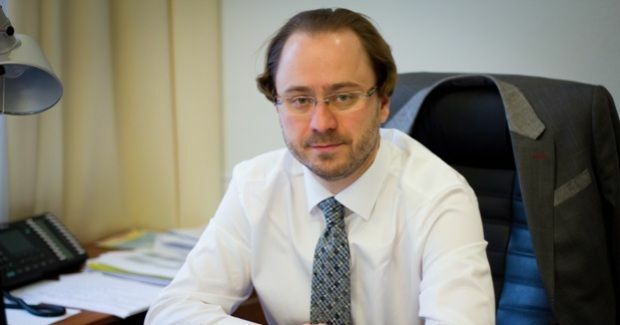 In March, you were appointed Deputy Minister of Finance for European integration. What are the challenges facing your office in this field, and at what is the time frame for them to be dealt with? It is very difficult to talk about European integration in the framework of a single ministry. This is a complex process, a challenge not only the executive is facing, but also, in fact, all branches of power. The most precise reference point for us by far is a cooperation program with the IMF and the Association Agreement with the EU. It’s all made perfectly clear –this is an extremely ambitious - which is right in our case - roadmap. And now we are guided by it. We are focused on improving the technical standards of public financial management. This also applies to the management of state banking sector, the development strategy of state-owned and state-controlled banks, introduction of European standards in the non-banking financial sector. What is this strategy about? How will the state-owned banks operate in the near future? The strategy of state-owned banks to date is being drafted. Oschadbank, for example, has already done a great job with the assistance of PricewaterhouseCoopers, and has developed an interesting draft of its strategy. Soon it will be submitted to the bank’s Supervisory Board first, and then – presented to a wider audience. Ukreximbank is also preparing a strategy for its development, and we hope to see it soon. We’ve been planning to impose the task of preparing Ukrgasbank’s strategy on its new administration, already after the transition. We will be giving Ukrgasbank quite ambitious tasks. The strategy of its operations and its development will be based on the idea of making it a proper and nice commercial banking institution, which will become a target for strategic investors in 5-7 years. In Ukrgasbank we want to apply a professional approach to the management of the commercial banking institution - the bank must have a high-quality management, high-quality transparent governance structure, including through attracting Supervisory Board of independent directors, including foreign experts. We hope that this will give the bank a significant incentive for quality development. It [the bank] may be able to open new niches, such as financing of small and medium-sized businesses, and energy efficiency projects. But we do not dictate to Oschadbank, Ukreximbank and Ukrgasbank, how they should manage the business - we are public servants, not bankers, regardless of our education and work experience. When Ukrgasbank becomes profitable, it will be sold to an investor? Or will a part of its assets still be owned by the state? It is too early to discuss that. But if it’s a quality asset which the state can bail out for heavily and cover its costs, and also earn money for the budget, then what are the advantages of a minority stake? But we will discuss all this on our way out of the crisis. Are any negotiations underway with international partners on their participation in the capital of state-owned banks? We’re conducting preliminary informal preliminary consultations with international financial institutions about the possibility of their involvement in cooperation with Ukrgasbank, including in the context of them potentially joining the bank’s capital. We have had preliminary discussions with the EBRD and IFC. We were not told “No”. We were told that they were ready to consult with us. For them the issue of the appointment of new management was also important - they were waiting for the new leadership, with whom they could talk. This [new] team is already there, the government appointed Ukrgasbank’s Chairman of the Board, and then the first members of the board have been appointed. The process will be completed in the near future, and we can recommend the management to start a dialogue with international partners as a next step. On what conditions can international organizations participate in the capital of state-owned banks? International organizations will be able to join the capital of state banks as minority shareholders, while the state remains the majority controlling shareholder. The idea of involving international financial institutions as minority shareholders is not just a formality. We don’t just want to have, say, the EBRD, on the list of the shareholders. We want this investor to take an active part in the management of the bank, appoint its representatives to the bank’s governing bodies. And those should be not just random persons who would sit there and listen to the bank's management reports once every six months. We want them to participate in the bank’s development strategy and in its new projects. How much money is needed for international organizations to participate in the capital? It will be necessary to perform the bank’s due diligence at the time when these conversations will be substantive. Any talking about numbers today is pure speculation. The EBRD has already declared its readiness to join the capital of the two Ukrainian banks, and one of them is state owned. Are we talking about Ukrgasbank here? As I was directly involved with the EBRD, I can say that the discussions are only at the initial stage. However, the EBRD makes decisions quickly enough. Our goal is to start cooperation with them in 2015. You spoke about the appointment of the head of Ukrgasbank. The competition commission has repeatedly been accused of carrying out a non-transparent contest. Tell us how it went? Who participated in the competition, besides the winner? The process had begun long before I came to the Ministry of Finance. A competition was announced in the last third of December, 2014, and it was completely open. The initial list had 21 candidates in it, from which a few people failed to pass to the second round of selection for technical reasons. The entire list of candidates was then rated by an Ukrgasbank competition commission and submitted to the Ministry of Finance. The ministry, in turn, guided by the norms of the Resolution No. 777 of the Cabinet of Ministers, sent a list of the top five ranking candidates (the maximum amount provided for in the said Resolution) for consideration by the Nominating Committee. The committee meeting was attended by its head Yuriy Logush, director of the EBRD for Ukraine Sevki Acuner, business ombudsman Algirdas Semeta, and the ministers of energy, agriculture and infrastructure. As a result, the choice fell on Kyrylo Shevchenko. How is choosing Shevchenko – ex-director and co-owner of the insolvent Terra Bank – justified? Were the committee members familiar with the criticism of Shevchenko on the Internet? Absolutely. But let's call a spade a spade: if anyone gets in the public field, there’s suddenly a huge amount of valuable sources ready to tell about their “terrible sins.” I know Mr. Shevchenko as a professional banker. And the fact that he is being blamed for – that he was an ex-director and co-owner of insolvency "Terra Bank" – is, to put it mildly, incorrect. [That] bank became insolvent relatively recently, and Shevchenko was its manager and co-owner much earlier. Look at the Ukrainian banking sector in general. Unfortunately, with the exception of Western banks that have been operating for many years and follow European standards in full, we have very few banks that we have no issues with. Most of them can be questioned, and the questions may be harsh, which is rather in the competence of law enforcement agencies, and also there may be questions on the issues of quality of management and quality of management decisions. When will the merger process of Ukrgasbank and Kyiv Bank be complete? Will this experience be used in Ukrgasbank? As a result of this transaction, all liabilities of the Kyiv Bank to depositors will be transferred to Ukrgasbank. But the issue of additional capitalization of Ukrgasbank will need to be resolved in this regard. The decision on the Kyiv Bank has been made. This is the first transaction of this kind, it worked well. I cannot be sure whether this approach will be used in other situations. We need to see how the market develops. Of the banks that are today in the Guarantee Fund, I'm honestly not sure that there are any assets that Ukrgasbank is interested in. Was it a market process? Kyiv Bank was not an independent bank. At the same time, it had significant assets and liabilities, which could be worked with. Ukrgasbank was chosen as a natural institution, a receiving bank. The question was only of proportionality and manageability. Why are both banks – the receiving bank and Kyiv Bank – state-owned? Do you see what the situation is like in the banking world today? It is really difficult to find a commercial bank today that would be interested in such a deal with Kyiv Bank. There’s another state-owned bank – Rodovid Bank. What is its fate? In Rodovid Bank we are working on a strategy, there is an ongoing lively discussion. No final decision has been made yet, but we are interested in considering the idea of a reorganizational bank. Legislation on this issue has already been adopted, but it’s far from perfect. The law needs to be modernized in accordance with international standards. Given the situation in the banking sector, where the level of bad debts is high, the presence of a proper reorganizational bank would actually help the entire banking sector. The bank can collect bad assets and work with them in order to extract their maximum value. The Memorandum with the IMF provides for the allocation of up to 4% of GDP in the banking sector. How will the funds be spent? That’s absolutely true. According to the program of cooperation with the IMF, the budget includes funds for the potential additional capitalization of banks, as well as providing for the financing of the Deposit Guarantee Fund. This is what we are fully implementing. The first program of the Fund’s financing for this year with $20 billion has already implemented. Regarding the possibility of the banks’ additional capitalization, we have a banking sector regulator – the National Bank. We are holding consultations on this issue.